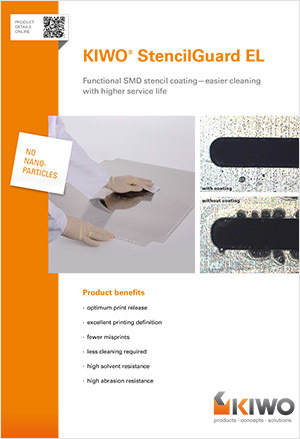 The KIWO StencilGuard EL protective coating is 2–3 nanometres thick and has thus no influence on the material thickness of the SMD stencil. On the contrary, the coating shows high mechanical resistance and is also resistant against common cleaning media – inluding solvents. The coating significantly reduces contamination (e.g. solder balls, flux) sticking on the stencil underside. Lower cleaning requirements + higher quality = lower process costs. The practical KIWO StencilGuard EL Setbox contains the primer, the coating components and a dosing insert, as well as lint-free cleaning cloths to do up to 25 SMD stencils. Try for yourself and reap these advantages for your SMD process.